Item # 314699 Stash Points: 595 (?) This is the number of points you get in The Zumiez Stash for purchasing this item. Stash points are redeemable for exclusive rewards only available to Zumiez Stash members. To redeem your points check out the rewards catalog on thestash.zumiez.com. Does your room smell like spilled beer and stinky socks? 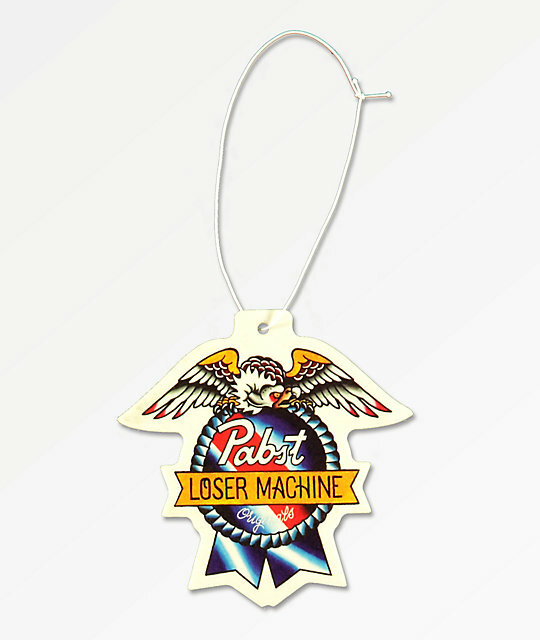 Pick up the Air Freshener from Loser Machine x PBR. This double-sided air freshener features a Loser Machine and Pabst Blue Ribbon collaborative graphic of an eagle along with Pabst's famous blue ribbon. The design is complete with a fresh vanilla scent to mask all of those unpleasant smells. Air Freshener from Loser Machine x PBR.